Get up. Get out. Do some good! The best part of my job? Checking out Do Good channels for cool stuff. They're filled with tons of great ways to get involved and to make real and important change in communities across America. From Do Good Atlanta - the Atlanta Community Food Bank needs schools supplies for kids in need. From Do Good Boston - on Sunday, November 8th take part in the 1st Annual Victoria Mosier Memorial Run in Raynham, MA to benefit Homes for Our Troops. From Do Good Chicago - the United Way of Lake County needs volunteer readers and tutors to help elementary school kids. From Do Good Hartford - Timothy Memorial School in Norwalk, CT needs used cell phones and ink cartridges (and honestly, who doesn't have this stuff sitting around their house - get rid of it!). From Do Good Nashville - see Alexander and the Terrible, Horrible, No Good, Very Bad Dad at the Nashville Children's Theatre. From Do Good Palm Beach - help the YMCA of the Palm Beaches build a heart trail in West Palm Beach, FL. From Do Good Rochester - the School of the Holy Childhood is having their annual craft sale on Saturday, November 7th. From Do Good San Antonio - the Volunteer Services Council of San Antonio State Hospital needs gentle used artificial Christmas trees for their patient care areas (I love this one). Helping kids. Helping the troops. Helping the hungry. Helping the disadvantaged. Helping others. You should check out a Do Good channel today and do some good. We're lucky. At good2gether we get to work with thousands of great nonprofits who do amazing things in their local communities. Here's one that we'd like to bring to your attention. Homes for Our Troops is a great organization doing amazing stuff – building homes for disabled vets. It doesn't get any better than that. They're having a road race fundraiser on Sunday, November 8th. If you're in the greater Boston area (the race is in Raynham, MA), please check it out. You'll be helping out some really special people doing important and needed work. Hollywood in Melrose, MA, originally uploaded by Middlesex Fells. A little non-good2gether blogging today. Ben Affleck is in Melrose, MA today shooting The Town. It's based on the book Prince of Thieves. 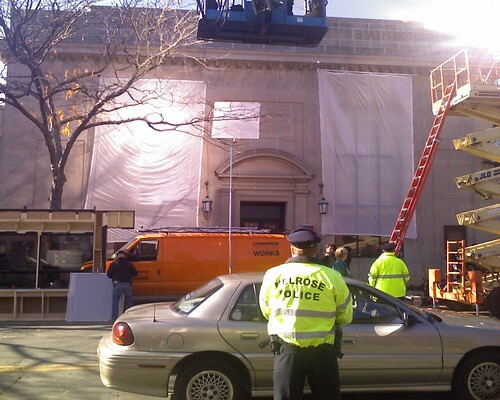 Hollywood comes to the little town of Melrose, MA. That’s the way to do it - the Crittenton Women’s Union edition. It's terrific to see a nonprofit really 'get it' and take advantage of everything that using a Do Good channel has to offer. Incidentally, if you or someone you know is looking for a job in the nonprofit space, check them out - they have 11 new jobs listed! The folks at USA Today continue with their commitment to philanthropy and doing good with the launch of Kindness. Wish you could find more positive stories in the news -- stories that inspire and uplift you? You've come to the right place. Kindness is your daily source of inspiration and guide to making a difference in fresh and exciting ways, no matter where you are. Each day, this site will unearth unique stories of giving with exclusive interviews, dives into news stories, plenty of tips, and links to interesting resources. But we're also building a community, and we look forward to hearing from you. * What are you doing to make an impact? * Do you have advice for other readers in the conversation? * Or maybe you've been looking for new and creative ways to get involved, and just need a little guidance. * What tools can help? The Kindness forum lets you start your own conversations threads and connect directly with other readers. I'm going to be participating in the discussions as well, so send your questions and tips or direct message me at any point. I believe everyone has the power to make a difference. If you're reading this post, you may think the same. Let's get started. As always, we're thrilled with the inclusion of the connect2cause widget so that readers of Kindness can connect with local nonprofits. Interested in the transformation of healthcare? It's a hot topic – the transformation of healthcare in the United States. If you're interested in it, attend the only conference that brings it all together – CIMIT Innovation Congress 2009 in Boston. Check it out here. Interesting article in the Sharing section at USA Today – Twitter users network to raise funds for charities. Check it out.